College hockey comes in many forms. It ranges from NCAA Division I through Division III, to the many levels of ACHA Club hockey. There is a league for nearly everyone. 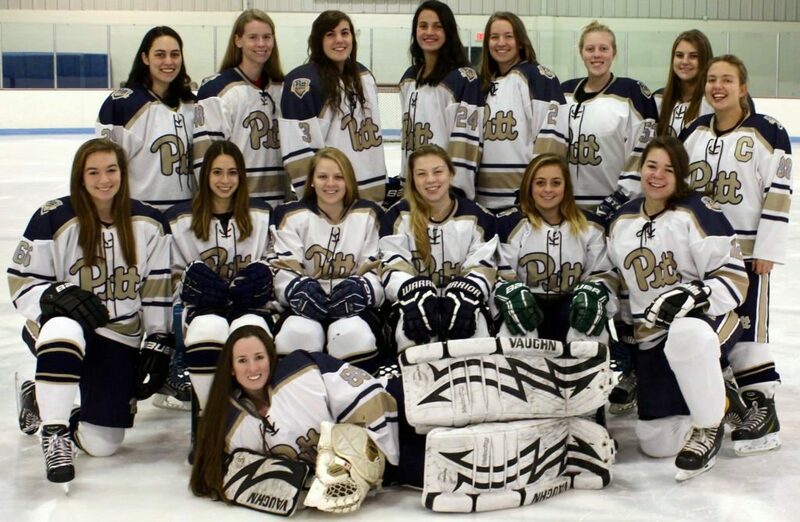 At the University of Pittsburgh, the ACHA Division II Women’s Club team, referred to by its members as the Pitt Women’s Ice Hockey team, is in its second year of existence, and it is thriving. The team came into existence last year, when a group of girls got together, organized and created a team with a core group of nine players. They eventually added three members during the early part of the season, meaning their initial team had a total of 12 players. The team struggled in its inaugural season, but the core group for the team remained. That, along with the right staff members combined to get the team heading in the right direction this year. A key member of any team is the coach. Pitt is led by Jim Napoli, a proud Pitt alum and a coach with numerous years of experience coaching girl’s hockey in the Pittsburgh area. His daughters both played hockey and Napoli was involved with both the North Pittsburgh Wildcats and Steel City Selects organizations as a result. He brings a wealth of knowledge and experience, which has undoubtedly been an asset to the program. One of his daughters saw an advertisement that the team was looking for a coach and told him about the opportunity originally. “My girls grew up and went off to college, so I wasn’t really involved in the youth scene anymore,” Napoli said. “I saw that they were looking for a coach, so I applied and was brought on board. … I was excited to get back into coaching at the university level. My youngest daughter played college hockey, so I watched a lot for four years, and I was excited to get back into the coaching aspect of it. This team has offered a number of people a unique chance to continue to play the game of hockey, while receiving a high-quality education at Pitt, and enjoying all of the perks that come with attending the university. Jackie Sharp, the team’s captain, and a native of Pittsburgh hadn’t played competitive hockey in years. When she was asked to join the team last season, it meant she was now able to play once again, and at the school she loves. It’s something she’s very thankful for, especially since her original playing career ended abruptly. The opportunity to play in college, one that many of the team’s members didn’t originally foresee when they enrolled, is one the’ve take pride in, and it’s evident in their dedication to the team. Sharp gets up at 4:30 a.m. for practice, normally twice a week. They ride to their games in vans, filled with hockey bags, sticks, a number of players, and are driven around by their coaches. The club hockey team, while receiving some funding from the school, is not like Division I where players are receiving scholarships to play. These girls are paying for school and to play hockey. The team, like many club teams across the country, has fundraise to support the team. As the team’s treasurer, Sharp has an inside look to just how much is necessary to keep the team afloat. In their inaugural year, the team did things like bake sales and a jersey sale, and then with the help of the university, wrote over one hundred letters asking for money from mainly family and friends. The school call such campaigns Engage Pitt, and they received a generally favorable response. Going into this year, they knew it was something they could look to continue. They also set different donation amounts that corresponded with different things the team could purchase as a result. The campaign had a goal to raise $4,000. It raised nearly $8,000 this year. That money has been supplemented by ticket sales, bake sales, jersey sales and more. It allows them to help with the cost of hotels, jerseys, socks, ice time and more. All of the financial success is being enhanced by the team’s success on the ice. With a group of experienced players and Napoli at the helm, the team was looking stronger from the get-go this year. Another big positive was that goaltender Katie Pucci transferred to Pitt from Penn State, giving them a solid presence to build around. That allowed Sharp to play out on defense, her natural position after filling in as goalie last season. With all of those pieces in place, the team was ready coming into the season. Their roster now has 17 players, impressive growth in just two seasons, and the team has experienced success on the ice. The team has an 8-6 record, and are currentlyranked ninth in the East Region . The team played its last four games against Buffalo, currently ranked No. 3 in the East. In their first matchup, when Buffalo was undefeated, Pitt won 3-2 on a last-second goal in overtime. Buffalo won the next night, but a split was very impressive. This past weekend, the teams split once again, proving that Pitt is a force to be reckoned with, despite the relative young age of the program. Their success on the ice is noteworthy, and they have shifted their focus to a big next step. They have set a goal to make the ACHA Nationals. To do so, they would need to move up to sixth in the east. Winning two of four against Buffalo, which they just accomplished, should help in that regard. This success on the ice in just their second year is noteworthy, but they are making an impact in the community, as well. They are role models to younger hockey-playing girls, and it is something that they embrace and really enjoy. “We have a lot of youth engagement. It’s really neat, because girls’ hockey has just been growing exponentially,” Sharp said. “We had a little group of girls from Canada asking if they could come to our game when they were here for a tournament. So they came to our game, came to visit us, so we’ve been involved with them. The role that Sharp and her teammates can play in the lives of younger girls that play hockey really excites them. The team from Dallas was a great example of a group that doesn’t really have older role models close to home. They have to leave the state just to play other girls’ teams. The opportunity to meet girls playing college hockey was a great one for them, and gives them people to look up to in terms of both school and hockey. The importance of the ambassador role is something that Napoli certainly knows. He was involved with a program for the Girl Scouts and developed a Learn to Play Hockey for Girls program with the North Pittsburgh Wildcats. “They see themselves and they act as role models,” Napoli explained. “It’s tougher on the female side because it’s not like they have all the Mario Lemieux’s, Wayne Gretzky’s, and Sidney Crosby’s to look up to. It’s kind of growing with the National Women’s Hockey League, even with the Women’s National Team and the professional players, it’s growing, but I think a lot of these girls don’t necessarily recognize a lot of those role models. The players on this team are now ambassadors for women’s hockey. They are also ambassadors for the university. Girls who play hockey and want to attend Pitt for the academic benefits can now get the best of both worlds. They are able to play the game they love at the University of Pittsburgh. “It’s a great place to go to school and it’s a great place to play hockey now,” Napoli said. Sharp can definitely relate. She went from playing inline hockey to playing boy’s ice hockey for less than two seasons in high school. Then she was a skate guard, until she joined this team, first as a fill-in goalie. Now, in her last year at Pitt, the engineering major working almost full-time while also balancing her class and hockey commitments, she is the captain and defender for the ninth-ranked team in ACHA Division II East. You can keep up with the team via their website, Twitter, or Facebook page. They play their games at Shadyside Academy in Fox Chapel and their schedule can be found on the website. They invite fans to attend their games, and also welcome anyone interested in volunteering. For youth hockey players interested in meeting the team, or high school students looking to attend Pitt and play hockey, they invite you to reach out to them via social media or their email address, pittwomenshockey@gmail.com for more information. Their next game is Saturday at 7:50 p.m. against California University of Pennsylvania.